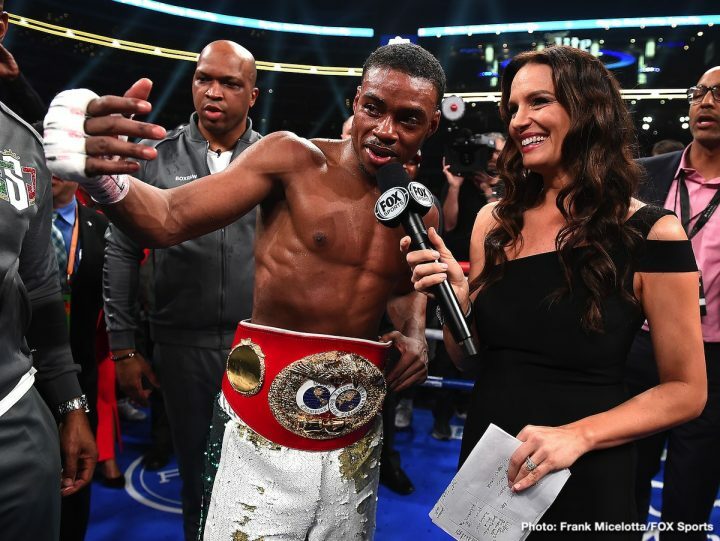 By Chris Williams: Errol Spence Jr. says he’s not fazed at all by Manny Pacquiao seemingly having second thoughts about facing him next after agreeing to take the fight with him last Saturday following Spence’s win over Mikey Garcia. Last Friday, Pacquiao created a 4-fighter poll on his Twitter account, asking his boxing fans to select his next opponent. Spence’s name was left off the poll by Pacquiao. The fighters that Pacquiao included on his small poll are the following guys: Floyd Mayweather Jr., Keith Thurman, Danny Garcia and Shawn Porter. Pacquiao completely left out Spence’s name for the poll, which has a lot of people thinking he’s decided to duck the fight with him. If that turns out to be the case, it would be a bad look for Pacquiao, because he’s an all-time great, former eight division world champion, and a senator in the Philippines. When politicians say they’re going to do something, their constituents expect them to follow through. If Pacquiao having second thoughts about fighting Spence is a bad look. Last Saturday, Pacquiao said, “Sure, why not?” when asked by Spence if he would be willing to fight him next. Now it looks like Pacquiao has had a chance of mind and is looking in a different direction for an opponent for his next fight. The sad thing about Pacquiao fighting one of the four guys in his poll is he’s likely going to lose to them, and once that happens, it’ll be pointless for Spence to fight the Filipino star. Spence (25-0, 21 KOs) isn’t going to want leftovers in fighting a guy who is no longer the WBA ‘regular’ world champion, and is in a needy position. If Pacquiao gets embarrassed by Keith Thurman, #2 runner up in the voting in his poll, there won’t be reason for Spence to fight him. Spence would be better off fighting Thurman than he would Pacquiao once he loses to ‘One Time’. Of course, what happens if Pacquiao ignores Thurman being selected as the next highest vote-getter in the poll? Does Pacquiao ignore Thurman too, and go ahead and fight the #3 vote-getter in Danny Garcia? Pacquiao can forget about Floyd Mayweather coming out of retirement to fight him, because he’s not going to do that. Mayweather is retired as far as boxing goes. That means Pacquiao will need to fight the next highest vote getter in the poll, which in this case is currently Thurman. It’s too bad Pacquiao didn’t include Spence in his poll. The way that Pacquiao left Spence off the list, it shows you how much respect he has for him. At the same time, a lot of boxing fans are going to lose respect for Pacquiao if he ducks the Spence fight after agreeing to fight him.